A method, when stated as straightforwardly as possible, is a few things at once. It is charitable, in that it seeks to give others a means to successfully proceed. It is self-centered, in that it seeks to establish the method, and the voice that states it, as the center of authority. This despite any protestations of flexibility – for what will happen if we stray from the outline? Perhaps, somewhere between these two, it simply seeks to perpetuate itself. Now, let me hesitate over that. When we state things this way – one guess, two guesses, a guess in-between guesses – we see them rhetorically, and not yet methodically, nor quite as a picture of the world. That is, we raise issues provisionally and without any solid commitment. A state of evenhandedness, of bothness, like this exists as a transitory position in text, but rarely becomes so fixed as to be a position to occupy in the world and in thought. That is, we are very uncomfortable with both. Both is a failure to articulate, and a failure to decide – to us, it has the same wishy-washy quality of a double exposure. It is fundamentally a species of trick, played less to out-and-out deceive than to simply cast doubt. The critical text must struggle between the two or more sides of the both to resolve itself; it must list, however slightly, to one side by its conclusion. A particularly exalted sort of text leads the reader to believe that their own preferred slant is probably the right one. Otherwise, you have been wasting time in reading it; because, implicitly, you have not garnered another proposition to fit into your own inescapable both. That points to the base problem with both – it is not satisfying as a proposition. The either-or settles, excludes, clarifies; the both-and pauses at a counter and orders everything on the menu. At its purest, it does not discriminate, and does not decide. Both is allowable when constructing a model. Here, instead of a superimposition, the two sides are shown in balance through a cutaway diagram of the problem being described. Such a percentage of this, such a percentage of that. This is also one type of synthesis, a set of balanced scales generally constructed in order for its maker to rest a finger on one side. This is not quite the both I am after, which is an irreducible duality; the third position of Indian catuskoti logic, A and not A. Our justice system puts forth that one is either guilty or not (well, probably not) of a criminal offense; if you are guilty, your sentence is raised or lowered depending on the circumstances. This satisfies some aspects of what we want societally, but fails others. It gives a measure word to help us with a mass word – you are two years guilty, or twenty years guilty. Here, everyone can reconcile themselves to the situation; the decision is either wrong or right, and the argument must either be concluded or forcibly resuscitated. But the judicial decision also loses the unboundness of the mass word, guilt – the sense in which there are liquid contours to every case of guilt, liable to shift depending on the shifting attitudes of the ones involved. Any guilt, at any given point in its body, may be seen to fold in some layer of – if not innocence, then inculpability. Acknowledging such a both means trailing off, means thinking further at some other date; it means deferment, and nothing being done. Turn this around to our social guilt. No one cares greatly to properly prosecute me of what I am guilty of; there is no proper measure to it. Imagine measuring forty megarads of racism. Even a carbon footprint is counterweighted against other vices and virtues. In the same way, utilitarian arguments over population founder over the notion of lives never lived – for well or ill? – because goodness cannot be counted and quantified in certain of its forms. It is not the same sort of problem. Come back, I’m getting to the point here! A landscape, to be sure, is not worth making if no one enjoys it, and no one makes use of it. Once any someone slips through the cracks, the negotiations begin. Martha Schwartz makes a rooftop garden in Cambridge for a biotech company. 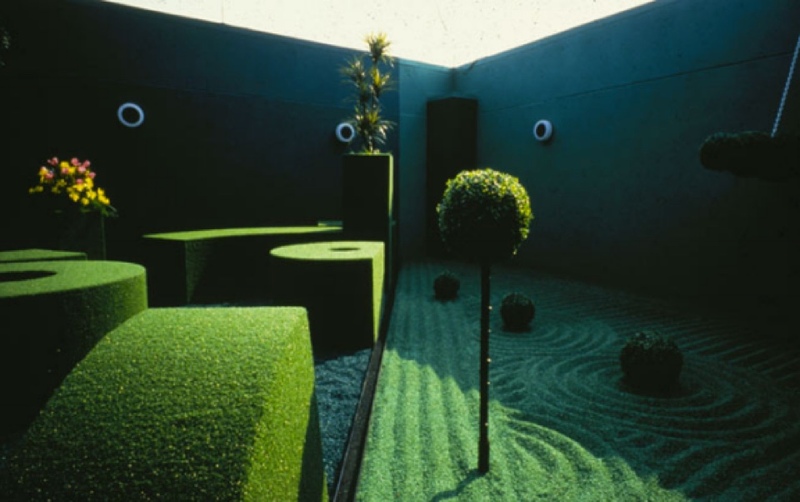 This Splice Garden, an arrangement of green geometric forms, is intended to be both modern and baroque, virtual and actual. The result is a genetic chimera – it registers as a viable entity, and it lacks clear lines of demarcation between each merged individual. It is not so much that it has a snake for a tail and a goat’s head between its shoulders. Rather, it has a moderate rash of scales, and snatches of goat’s beard around its body. Upon completion, the garden is seen by no one without business with the company or special dispensation from the company. It is reported to be aging poorly – the initial bargain of the artificial materials having failed over time with weathering. The images made of it, though, avoid deterioration through duplicating themselves. Might the project have enjoyed this multiplication without being built? Sure – it’s common enough for architectural projects. But this one was cast forth into space and time, becoming not only a move played in a career, or an utterance in the professional and theoretical discourses, but also a physical record of what a particular sort of company in a particular place was willing to pay for and maintain to a particular standard. That a client relationship produces such things makes them less reliable indicators of issues within the sphere of design, but ultimately, to me, more interesting propositions. If we are interested in boths, this project is not only a formal both, but from being built becomes both a place and a proposition. Squinting to see them both is a way to make out something of the integuments that hold the two together. Similarly, Tilted Arc continues to reverberate, not only from being a Serra, a move that Serra played, but from antagonizing office residents, from occupying press space, and academic space, from underlaying Schwartz’s work, now in turn interred under another. Back to method, where we started. If this excursion tries to add a word to our vocabulary, it does not try to add a method. The wonderful thing about criticism, to me, is that it is straightforwardly a space for both – that it may forthrightly double around on itself with a minimum of hurt feelings.